James M. Gariepy, became the owner of McClellan Funeral Service in July 2005 which is now known as McClellan-Gariepy Funeral Home, Inc., graduated from Cohoes High School in 1987 and from from Hudson Valley Community College in 1989. He served his funeral directing residency at Brown Funeral Home in Plattsburgh and received his funeral directors license in October of 1990. He worked for eight years in Canajoharie and Fort Plain before relocating to his hometown of Cohoes where he worked in Latham. Jim is a member of the Greenwich Elks Lodge 2223, the New York State Funeral Director's Association, Adirondack Funeral Director's Association, Capital District Funeral Director's Association and the New York State Association of County Coroners and Medical Examiners. He is also a member of the Salem Knights of Columbus, Council 10848 and a member of the Salem Rescue Squad. 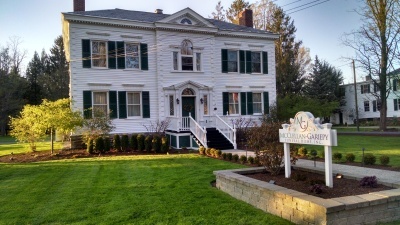 Jim serves as a Coroner for Washington County and also became the owner of Ackley & Ross Funeral Home in Cambridge on January 8, 2015 which is now known as Ackley, Ross & Gariepy Funeral Home. Jim has worked for the funeral home in Cambridge for 9 years until taking ownership. Jim resides at the funeral home in Salem allowing him to be able to serve the community whenever he is needed. Jim is a member of Holy Cross Church in Salem and also a member of the Men's Group at the church. Jim's son Michael graduated from Salem Central School in 2016 where he played on the school's basketball team. Michael can be seen occasionally helping out at the funeral home during wakes, funerals and working around the funeral home property with his dad. Michael currently attends SUNY Canton and is a member of the Lacrosse team. Jim brings many years of experience in funeral service to the Salem area and is very sensitive to the needs of grieving families. Jon McClellan, was the owner of McClellan Funeral Service since he acquired the business from his father in 1965. Jon has faithfully served his community in all aspects of funeral service. After forty years of ownership and many years of finding the right person to fit the needs of the families and fit into the community, Jon decided to sell the funeral home to Jim. The McClellan family has placed their trust in Jim to continue the tradition of serving families of Salem and the surrounding communities. Kara J. Hanks graduated from Salem Washington Academy in 1991 and graduated from Hudson Valley Community College in 1996. She served her residency at Sullivan-Minahan & Potter Funeral Home in Queensbury and received her funeral directors license in 1998. After receiving her license she started working at McClellan Funeral Service. Kara has been a member of the Salem community her whole life and resides with her husband Darr and three children, Chloe, Hannah and Dillon. Darr is a registered nurse and works at Glens Falls Hospital. Kara and her family are members of the First United Presbyterian Church in Salem. Vicky A. Campbell graduated from Granville High School. Vicky attended Hudson Valley Community College where she earned a degree in applied science. Vicky served her residency at McClellan-Gariepy Funeral Home and received her funeral directors license in 2010. She has worked in the Emergency Medical Services field for many years and currently works full time at Salem Rescue Squad. She is the Captain of the Salem Rescue Squad and is a member of the Salem United Methodist Church. Vicky is married to Dennis Campbell who works for Stewart's Shops and they have a son, Kyle who attends Granville Central Schools. Vicky and her family live in North Hebron. It is with comfort that local individuals who live and are a part of our communities are there to help families who have had a loss. Gregory Ston McClellan who helped at the funeral home, passed away January 20, 2011. He was well loved by the community and is missed by those who worked with him closely each and everyday.